After defeating the Taishibethi, Oryx returns to his throne world and makes preparations to have his first direct meeting with the Deep. He creates a special alter for the Deep and prepares an unborn ogre for it to possess. We’ve seen unborn ogres several times in Destiny. You might know them better as Tomb Husks. Please, can you help with your assertion above ^? In the depths of the Dreadnaught, a coven of Acolytes gestate an abomination – a warspawn of the Hive, pulsing and growing in a pool of Taken power. The souls (of nearby Hive champions you just killed) nestle within the husk. Find its gestation pit and summon forth the beast. Do not allow its worm to complete the cycle. End it now. So, it seems that the tomb husk was not the Ogre but was the thing needed to birth the Ogre early. This fits with Toland talking about tomb husks having the energy needed to break Hive rune locks. I wondered about the conflict between Toland and what I thought I remembered from the Summoner's Circle but forgot to investigate. 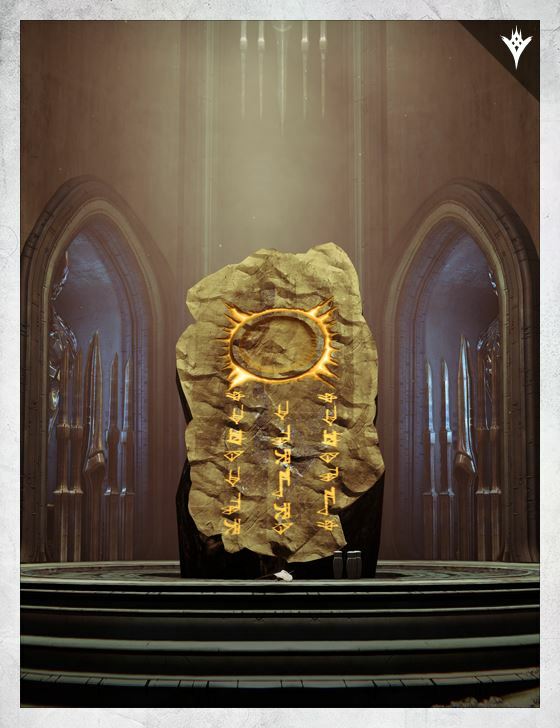 Do you think the rock in the map Cathedral of Dusk could be one of Oryx's tablets? The 'table stone' of an altar? Gravemarker/tombstone? It's possible. I don't think there's anything to say it isn't. I do wonder if he'd have just left it laying around. Presumably, Oryx was still alive in his alternate dimension for part of the time we were holding Crucible matches so it does seem a bit unlikely he didn't have his tablets with him. But given that the Dreadnaught is kinda his throne world in and of itself... maybe sitting right there in its special spot is considered being with him?